While more studies to understand the life and intellect of dolphins are on the agenda, in 2012, some scientists stated that these cetaceans should be considered “non-human people” given their highly advanced intelligence and their incredible capacity for abstract thinking, capabilities previously supposed to be unique to the humans. What does this have to do with the dolphins in the wild? Well, thinking that dolphins are non-human people means to consider them beings with rights protected by the laws in a similar way to humans, that is, they must be treated as equals and not as inferiors, which questions their capture and slaughter, as it should be considered murder. In this way, the captivity of dolphins ideally would be reduced. Ethics as a philosophy prizes the right of people’s freedom and this should be the same in the Animal Kingdom, but it has not been so, and many dolphins have spent their lives, sometimes their whole, living in harsh conditions and without the possibility to experience the freedom of their species. Life in captivity is not as fun as it seems in dolphinariums. To start with the most evident, free dolphins have hundreds of miles to swim in the ocean, explore and live for a long time. Captive dolphins have ponds or water bodies of several meters, which they can not leave unless their holders decide otherwise, very much like a prison. What about those dolphins that instinctively perform migrations? Free dolphins born, grow, reproduce and die according to their nature and instincts. Captive dolphins are forced to do several things, for example, they may be induced to mate, to consume a certain food or behave in a particular way. Free Dolphins retain their physical characteristics unless they are injured, but in captivity, they exhibit an atrophied dorsal fin, that is, it bends downward, perhaps because they spend only 20 percent of their time underwater compared to the 80 percent of the time that free individuals spend. Normally dolphins have a relatively long life in their natural habitat, but in captivity, both the longevity and the chances of survival reduce. These cetaceans may die during their capture or their transfer as a result of an inadequate supervision of the transport structures or as a result of accidents. In general, captive dolphins live fewer years than their free counterparts. Dolphins Swimming in the Ocean. Although dolphins can resist the transportation, their anatomy is not designed to withstand the weight of their body caused by gravity on land. Internal organs or bones like the rib cage can get damaged by carrying them out of the water. There is no certainty about the proper treatment of captive dolphins unless specific investigations are performed. Therefore, it all depends on the conscious of the people who capture them. While not all are ruthless, we know the where money is involved, some people sacrifice the security and comfort of the dolphins to get higher profits. Some people argue that in captivity dolphins are safe from predators such as killer whales and sharks, that they have guaranteed food every day and that they have the medical attention of professional veterinarians in case of injury or illness. However, we must not forget that they are animals perfectly adapted to the aquatic life and all that this entails, like the large space in the ocean, the diversity of food and the chance of socializing. The social life of dolphins and the tight bonds between them is also a major concern for dolphins in captivity as confined they have no contact with other mates or at most with a few of them also in the same conditions. Conservationists argue strongly about all this, but the release of the captive dolphins is still unlikely. Humans are a sociable species, we also depend on relations and connections with others to survive, and we all know that most lonely people is not happy and sometimes they have depression and other consequences related to that loneliness. As we are aware, one of the main characteristics of dolphins is their social behavior, so the answer to this is pretty obvious. Dolphins belong to the wild. While the demand for dolphins increases for attractions like swim with dolphins or Dolphin Assisted Therapy (DAT) programs, more and more dolphins are kept in captivity. 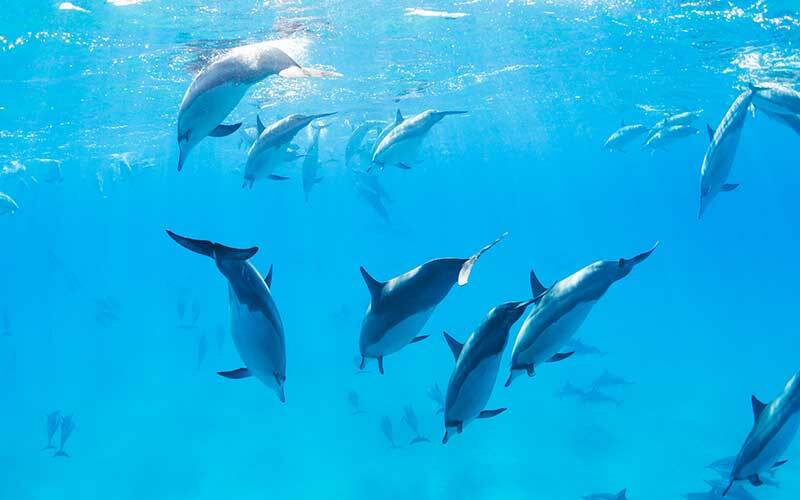 Some scientists claim that dolphin research is progressing in great strides, but critics believe that keeping wild dolphins in captivity is cruel and should be stopped. When contrasting wild dolphins to dolphins in captivity, there are vast differences in behavior, but the high cost of studying wild dolphins has made that scientific data available comes mainly from those in captivity. Wild dolphins can travel up to 40 miles every day and are constantly on the move, foraging for food, playing and fighting within their pods. Sometimes they submerge to great depths and are hard to follow. 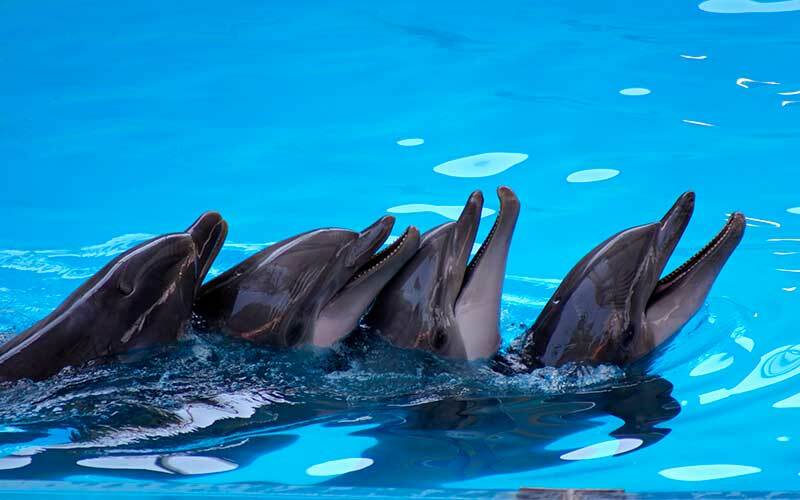 The need for continuous movement of Wild dolphins is one of the reasons that critics of captivity use as arguments to request the release of these dolphins. The process to capture wild dolphins has traumatic effects on them. Statistics show that 53% of the dolphins that survive the process will die within the first three months. Regardless that the dolphins we see in captivity seem to be happy, scientists believe that their boredom eventually leads to their premature deaths. Dolphins in captivity, spend only 20% of their time under the surface contrasting with the dolphins in the wild that can be up to 80%. Activities like beaching themselves in aquatic shows are against their nature because the dolphins in the wild would never beach themselves. Scientists believe that this is extremely harmful because resting on their bellies over a hard surface, will eventually damage their internal organs. At least 50% of the dolphins in captivity will die in less than seven years. Chlorine poisoning, diseases, and stress-related illnesses are the main reasons that cause the death of those in captivity. Sometime during the capture process, dolphins are herded towards the shore, separating those still swimming with their mothers from the pod. They are then trussed in a sling and carried from the water to a transport vehicle. Research proves this procedure is very traumatic to dolphins. US government researchers have found that mortality rates in bottlenose dolphins rise six-fold immediately after capture. Experience have shown that Dolphins in captivity do not live more than a few years. However, better caring procedures and advanced veterinary medicine, have helped them to live longer, sometimes as long as the dolphins in the wild. Scientists have not figured out yet why dolphins in captivity live less, as most wild animals in captivity, protected from their natural predators will always outlive their counterparts in their natural environments. Many animal conservation groups are demanding the release of dolphins in captivity, but while there is profit involved, this will be difficult to achieve. Use of Marine Mammals in Swim-with-the-dolphin Programs (FL,HI): Environmental Impact Statement, Volume 1. 1990. Janet Mann. Cetacean Societies: Field Studies of Dolphins and Whales. University of Chicago Press, 2000.